A popular argument in support of social media censorship is that publishers aren’t obliged to publish anyone who submits to them. Which is true. It’s why you can run your social media site as you please and block anyone you please. “My site, my rules” applies to all publishers. But social media sites are not publishers. They’re publishing platforms. We, the users, are the publishers. The social media sites are the presses that we use to publish our work and that of people we want to share with our followers. Social media sites are technologies, even in their particularities, since the monopolies are so absolute (eg twitter, facebook, YouTube). The comparison would be, when the printing press was invented, to tell someone they alone may not print their ideas, but they still had free speech. 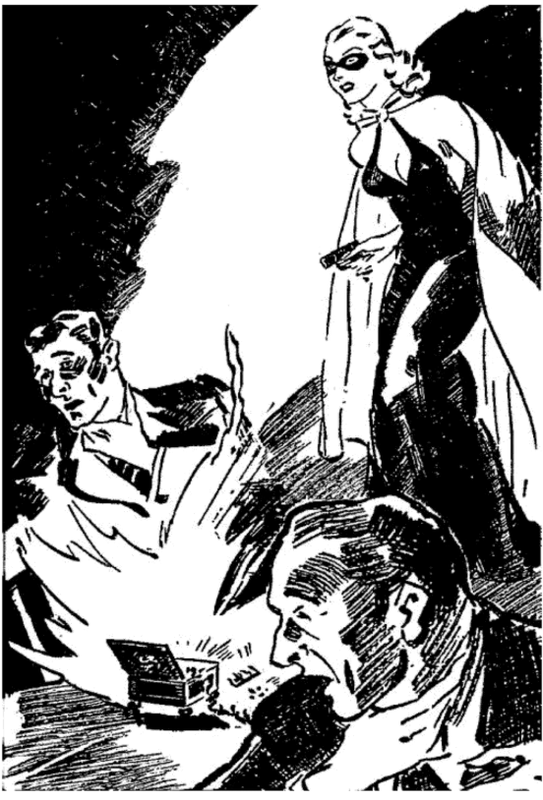 Historians of the superhero call the Phantom the first superhero for one reason: Early in 1936, two years before Superman's first appearance, the Phantom wore a skintight costume. 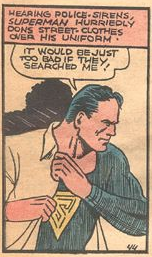 He met other criteria for being a superhero, but they're much older than comics or cartoons: he used an alias and wore a mask. But another costumed adventurer wore her skintight costume under her street clothes only a couple of months after the Phantom appeared. 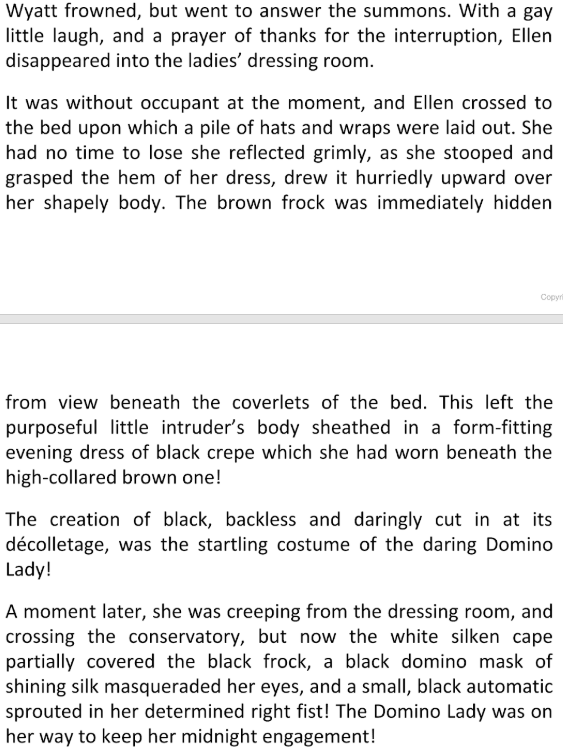 Did Siegel or Shuster read any of the Domino Lady's stories? I don't know, but it's likely—they loved pulp adventure. Even if they didn't, the Domino Lady appears to be the first superhero who wore her costume under her street clothes. She also may've been the first to refer to her adventuring outfit as a costume. Superman thought of his as a uniform. ...it may be hard to know exactly how many Sanders-Trump voters there were, or whether they really cost Clinton the election. But it doesn’t appear that many of them were predisposed to support Clinton in the first place. Which is why Sanders would've won. 2. To promote the plastics industry: Disability group wants pause on straw ban campaign - BBC News. Paper straws work. Yes, they can get soft if you take a long time with one. Then you get another. If you want to comment on the second point, before you do, please read If you think banning plastic straws is a mistake. 1. It’s not a complete solution. Literally no one is saying that it is. Change has to start somewhere. 2. It inconveniences disabled people. No one is talking about banning all disposable straws. Paper bendy straws are still available. As for Starbucks offering paper straws wrapped in plastic, meh. Straw dispensers are ancient technology. 3. It’s a moralistic solution that blames the consumer instead of capitalism. I’m a socialist, but this objection baffles me. We consume too much disposable plastic because of capitalism in general and the petrochemical industry in particular. Banning plastic straws is not a moralistic solution. It’s a systemic solution. What’s moralistic about telling capitalists they can’t have this market? By that logic, the automobile industry should not have been forced to provide seat belts.